One of the most effective ways to get your house ready to sell and make it more appealing to buyers is to declutter. Your realtor will tell you to get rid of almost everything that takes away from the overall aesthetics of the home, including notes on the refrigerator, knick-knacks, piles of paperwork, to-do lists, halfway finished crafts . . . you get the idea. For the most part, anything that isn’t necessary or beautiful is tucked away so that when potential buyers come through your home, they aren’t distracted by all of the personal items. You want them to see the house in its best light, and to see the potential for how they can make it theirs. It takes a lot of work to declutter a home, but whenever people do it, they’re always amazed. Suddenly, their home seems new — and a lot more appealing! Why wait until you’re trying to sell your home to enjoy a cleaned-up, decluttered atmosphere? Take advantage of your home’s full potential and get rid of all that stuff! The task might feel overwhelming, but the rewards are well worth it. Here are some tips to help you on your mission. Constantly weed. Just like a garden, your home needs constant attention to keep it from overgrowth. 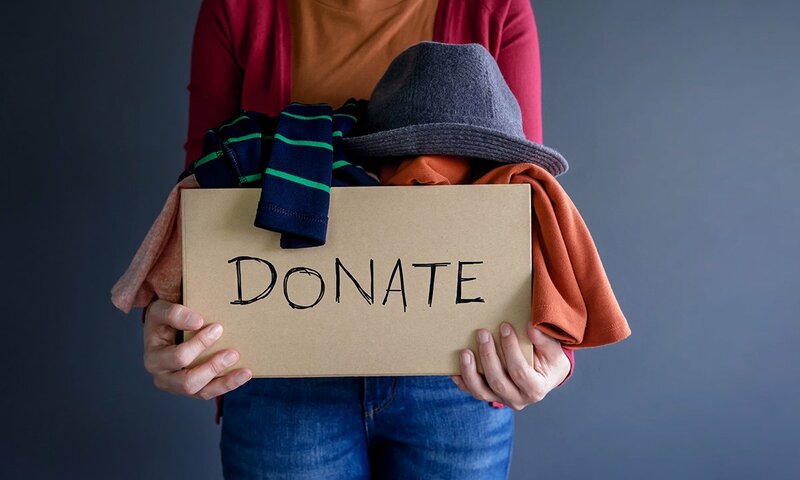 Keep a box handy and make it a habit to regularly put things in it to donate. Jewelry, clothes, shoes, toys, dishes, bedding . . . whatever you notice isn’t getting any use anymore, just drop it in the box and take it to your nearest donation center when it’s full. Deal with paperwork immediately. Paperwork is one of the most difficult areas to keep under control. By only handling it once, you’ll save a significant amount of time and energy. When the mail arrives, sort it that same day. Recycle anything considered trash and use a simple filing system for the items that need attention, whether it’s save, act upon (pay the bill, return the form, etc. ), or something else. Never let papers sit in piles, because you’ll end up forgetting what’s on the bottom . . . guaranteed. Delayed gratification. Let’s face it. Our homes tend to be cluttered because we have too much stuff. The next time you have the urge to buy something that isn’t strictly necessary, write it down along with the date. Give yourself a minimum amount of time that you will wait to purchase the item, whether it’s a week, two weeks, or a month. When the time is up, see if you still want to buy it. Odds are, the urge may have passed and you’ll find you don’t want it anymore. If you still want it, go ahead and buy it — and immediately find a place for it to live. Clear visual noise. Get rid of anything that’s visually noisy and unnecessary, like price tags or brand labels. When you store items in boxes or containers, you win a victory by keeping things neatly together and all in one place. However, you lose some of the ground you gained if you keep manufacturer labels and stickers on those containers. Even if those boxes are in a closet, your house will feel more calm and less cluttered without the extra visual noise. Whatever you do, the most important thing is to keep at it! Envision the way your home will look without the clutter and keep working towards that goal. Then savor the newfound mental space and sense of accomplishment. Bill Roberts Custom Homes are designed for your lifestyle. Whether you’re single, married with kids, or heading towards retirement, we have innovative floor plans that will help you live life to the fullest. Enduring craftsmanship and quality are our hallmarks. Learn more about us here.